In her marathon debut Ukraine's Olena Burkovska set a 2:30:50 course record in the 86th edition writes Alfons Juck. Jacob Chesire won the men's race with a personal best of 2:10:59. Burkovska's performance sliced 38 seconds from Alena Peterkova's 20-year old record while Chesire, who was alone in the second half and struggled against the wind, ran the third fastest men's time in Kosice. The men passed through 10km in 30:27 and halfway in 1:04:18, following Hlijah Tarus's sub-2:09 pace. After 25km the pacemakers faded and Chesire took the lead. He was still on sub-2:10 pace at 35km(1:47:22), with a lead of 100m. He slowed in the final stages but still improved his best time by eight seconds. Unkown Ethiopians in their first races outside their country from the Haji Adilo coaching group achieved excellent times and life-time bests by large margins. Times recorded for positions 2-6 were the fastest in the histoty of the race. In the women's race four pacesetters went through halfway in 1:15:22 but after 27km 28-year-old Ukrainian debutant Burkovska injected pace and had a 100m lead by 30km. She remained unchallenged and won by a margin of four minutes. Her half marathon best had been only 1:15:16, so this was a real breakthrough race. Former Slovak Prime Minister Mikulas Dzurinda finished 151st in an excellent 3:22:08 at age 54, in his 24th marathon. The special guest was double Olympic winner Waldemar Cierpinski who also ran a leg in a special promotional relay and promised that he might come back next year and run the full distance at the age of 60. Kosice is special for him as he ran his first international marathon here in 1974 and also his last in 1985, but never won. More than 5000 runners, an event record, competed in all events. A fantastic battle between defending champion Silas Sang and the 2009 World Marathon silver medallist Emmanuel Mutai produced a course record writes Antonio Manuel Fernandes. Helena Kirop, a late entry, took the women's race ahead of a pair of Portuguese runners. Altogether 15,000 people crossed the Vasco da Gama Bridge in the mass race. 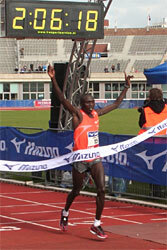 Mutai was the winner here in 2007, and both he and Sang were together from 15km, after Uganda's Nicholas Kiprono fell behind. Behind them, the "European" title went to Portuguese Rui Pedro Silva who crossed the finish line six seconds ahead of Spain's Jose Manuel Martinez. In the women's race Florence Chepsoi, Magdaline Chemjor and Helena Kirop ran together to halfway. Then Kirop imposed her strong pace to cross the line in 1:10:26. Her strength seemed to have drained the other two as two Portuguese, Dulce Felix and Marisa Barros, managed to pass them. Over 11,000 runners finished in all the related events of the 38th Portland Marathon, including 8,269 in the Marathon and over 1,000 military personnel in satellite half marathons held in Iraq, which were supported by the Portland Marathon. Runners and walkers came from all 50 states and 21 countries to participate in one of America's "Greenest" events. 58% of all participants were women! The event was solar powered for the second year in a row, and all finishers received "super" seedling trees, a virtual forest that could include over 150,000 trees planted over the last 17 years. 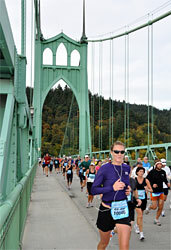 National and local charities raised millions of dollars through the Portland Marathon. Next year's event will be held on the magical date of 10-10-10. More than 3000 marathon runners stood at the start line and there were 13,300 participants over all distances including 500 marathon relay and Ekiden runners. The shorter distances were very popular amongst families and less experienced runners.With over 2000 runners from 55 different countries, the majority came from France, Great Britain, Finland, Germany and Italy, but there were some participants from as far away as Columbia, Japan, Thailand, Argentina and South Africa. Runners passed through the most beautiful parts of the Hungarian capital: across the Heroes' Square; down the famous Andrássy Street, past Buda Castle and the magnificent neo-gothic domed building of the Hungarian Parliament. 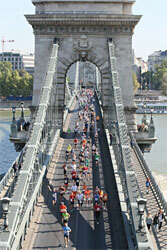 While running, they could admire the breath-taking view of the city from the iconic Chain Bridge. 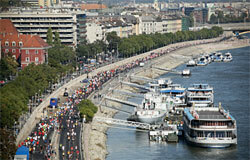 As the whole world celebrates the 2500th anniversary of the legend of the marathon next year, Budapest Marathon will hold its 25th anniversary marathon on 26 September 2010. Come and celebrate with us. 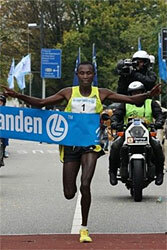 Abraham Potongole won on his debut, beating last year's winner Rik Ceulemans into second in the final marathon of his career. Brussels welcomed a record 2000 runners for the marathon, and in total there were no less than 8500 participants in all four races (including half marathon, 4km mini marathon and the Knack Weekend Ladies Run. The marathon lead group comprised four contenders at 10km along with two pacemakers: William Suparimuk and Abraham Potongole from Kenya, the Moroccan Abdelhadi El Hachimi and the Belgian Lander Van Droogenbroeck. Ceulemans trailed by 50m and Gino Van Geyte by 100m. As Van Droogenbroeck dropped back he supported Ceulemans in his chase: by 17km the pair were 20 seconds behind. By halfway (1:07:11) El Hachimi was dropped as Ceulemans came through. Pacemaking finished at 27km (1:26:08) after which Potongole started to push, and by 30km he was 32 seconds ahead of Suparimuk and 47 seconds ahead of Ceulemans. With 6km left Ceulemans had come back into second, 56 seconds behind an increasingly assured-looking Potongole. A tight endgame ended with Ceulemans seizing his chance to enter Brussels main square, the Grote Markt, as runner-up in his final marathon. A record field of over 23,000 runners and walkers enjoyed perfect spring weather and raised almost $300,000 for event charity, the Cerebral Palsy Education Centre. Over 4,000 runners took part in the full marathon. Every finisher had a special story but some really captured the hearts of all. Jenny Gillard celebrated the life and sporting achievement of her late sister Kerryn McCann, who gave Australia one of its greatest ever sporting moments when she won the Commonwealth Games marathon at the MCG in 2006. Kerryn's son Benton fired the start gun for the marathon. Gillard raced in memory of her sister to finish in eighth position, in what she said was a thrilling and emotional day. "I'm happy, emotional and proud to be a part of the Melbourne Marathon. It was a great feeling running in to the MCG," she said. In the men's race, Ethiopia's Asnake Fekadu became the first international athlete in 25 years to successfully defend his Melbourne Marathon title, while Lisa Flint, a 24 year old from Newcastle, NSW, took line honours in the women's race. As first Australian female and overall winner, Flint picked up the hat-trick of Melbourne Marathon champion, national marathon title and winner of the inaugural Kerryn McCann Memorial Trophy. Remarkably, Flint only started running three years ago after watching Kerryn McCann win the Commonwealth Games marathon in 2006. "I remember watching Kerryn's face at the finish (of the marathon), and she's been an inspiration. It was a buzz just entering the stadium today." Flint beat pre-race favourite, Japan's Satoko Uetani, by 46 seconds, smashed her personal best time by more than 13 minutes, and recorded a Commonwealth Games qualifying time. Fekadu was led out for the first half of the marathon by compatriot Wondwosen Geleta, who also recorded a PB to finish second overall. Fekadu left Geleta at the 25km mark but faded over the final few kilometres to win in 2:17.32, just 14 seconds quicker than in last year's more challenging conditions. 2007 silver medallist Mary Keitany dominated with the second fastest time ever, and led Kenya to an emphatic team win in the women's race, while Zersenay Tadesse won the men's race for the fourth consecutive time. Keitany broke away from Ethiopia's Aberu Kebebe just before 10km and pulled inexorably away to record a time bettered only by Lornah Kiplagat's world record won in Udine two years ago - a race in which Keitany broke through to finish second. Just over a minute behind Keitany came compatriot Philes Ongori (1:07:38) who in a sprint finish with Kebebe took over silver medal position for the first time just metres before the tape. The Ethiopian, who ever since being dropped by Keitany, had been running alone finished one second behind to take bronze. It had been a frustrating 24 hours for the diminutive Keitany. The day before she had found herself trapped in a lift for nearly an hour, and in the first half of the race she found herself having to set the pace without assistance. Kebede had been running right on her heels but declined to take over the lead when Keitany slowed in invitation. Keitany answered such non-cooperation with a decisive break, taking her through 10km in 31:04 and to a 15km split of 46:51, four seconds better than the World record, but "assisted" by excessive drop in the course to that point. Back down the field the Kenyan team victory was already secure despite the fact that Peninah Arusei had taken a nasty fall with 40 minutes of the race gone, as Caroline Kilel and Philes Ongori who had been running with her when the accident occurred were securely in third and fourth positions, nearly a minute ahead of the next athlete, Ethiopia's Mestawet Tufa. Ongori's late drive made up ground on Kebebe and dropped Kilel in the process. Ethiopia came in behind Kenya in the team standings Russia taking team bronze. 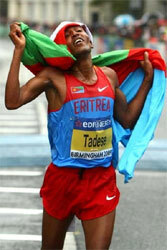 Tadese lived up to his billing by taking his fourth successive World title thanks to a sustained attack which began 10km into the race. Tadese had moved ahead at 5km last year in Rio de Janeiro, but waited longer in the cooler (11°C), and rainy conditions in Birmingham. Kenyans Kiplimo Kimutai and Sammy Kitwara, and USA's Dathan Ritzenhein all took turns at the front before Tadese edged ahead, passing 10km in 28:30. Kitwara, the second fastest man in the world this year had been one of three athletes trapped in the lift the day before, along with Mary Keitany and Ritzenheim. While it took its toll on Kitwara the American, like Keitany before them, was running the race of his life (his previous best was 1:01:35). With 15km (42:20) gone the reigning champion held an eight second advantage on his nearest pursuers. Ritzenhein was strongly contesting second place and for a couple of kilometres was 5-10m clear of Tsegay and the Kenyans. These four played out some intensely competitive final kilometres with Ritzenheim seizing the advantage in the final kilometre, only to be overhauled by Kipyego in the final straight. Packing well as always Kenya took the team title with Eritrea in silver and Ethiopia with the bronze. The USA was fourth just eight seconds adrift of bronze. 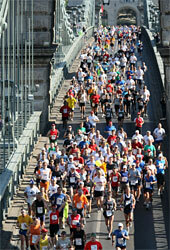 Brilliant sunny skies greeted the record 12,492 participants in the 30th anniversary edition. The Half Marathon and the 8km race sold out prior to race day, and registration numbers showed a dramatic increase over previous years: 3887 in the Marathon, 5571 in the Half Marathon, 2609 in the 8km and 1025 in the Thrifty Foods Kids Marathon. Marilyn Arsenault set a new course record in the Women's Half Marathon. The event featured a strong elite field in all the races, and also saw three-time Marathon winner and course record holder Steve Osaduik beaten into second place. He had trailed three Kenyans, Hillary Cheruiyot, Lameth Mosoti and Philip Samoei, in the first half but although he ran a negative split was unable to catch eventual winner Cheruiyot. Cheruiyot – who trains in Calgary – was delighted with his result. He told the large finish-line crowd that he liked the course and thought the conditions were ideal. "I will be back next year to break the course record," he said. 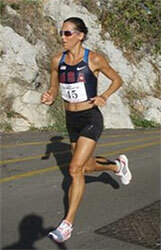 The much anticipated women's marathon race was won by the 2008 local winner Cheryl Murphy, who put in a strong performance just shy of the 20-year course record of 2:42:32. Vancouver's Katherine Moore bettered her third place finish of last year, overcoming the challenge of three-time winner Suzanne Evans. Murphy also captured the Masters title. 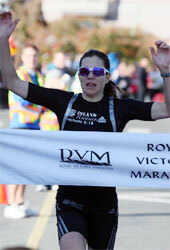 Victoria's Marilyn Arsenault broke the 2007 course record for the half martathon with a time of 1:15:39. The 41-year-old opera singer, who also won the Masters title, dominated the race coming in six minutes ahead of last year's winner Lindsay McLaren. 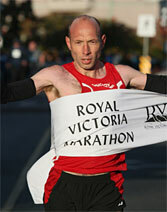 Local runners swept the podium in the men's half marathon, with Jon Brown taking an isolated win in 1:04:57. The event saw the highest number of finishers in the Half Marathon and the 8K Road Race – 4,602 and 2,150 respectively. The 2568 finishers in the Marathon was a 25% increase over last year, and the overall total of 10,352 finishers was another record for the event. 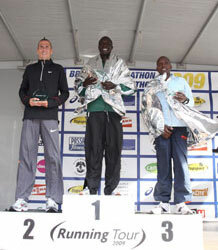 Geoffrey Mutai defended his title with a personal best and course record in the 26th edition writes Wim Van Hemert. 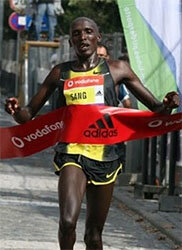 His very fast final stage, when he ran solo from 35-40km in 14:24, sealed the victory. Namibian Beata Naigambo also set a personal best in winning the women's race, despite strong winds in several places. From the start of the men's race there was a leading pack of more than 20 runners led by six pacemakers. They went through 10km in 30:13, and with most of them still in contention, through halfway in 1:03:56.. At 25 km (1:16:09) the lead group began to splinter. Mutai was running behind the pace makers at the front of the lead group which was reduced to 10. The next 10km produced only a little change, but with all pacemaking completed by 35km Mutai then accelerated and within a few hundred metres had opened a huge gap. The following group broke up rapidly and at 40km, which Mutai passed in 2:00:56, his nearest opponents Joseph Ngeny (2:01:41) and Phillip Sanga (2:01:45) were well back. Mutai continued to push and ran 6:05 for the final 2195m to finish with 2:07:01. Sanga and Ngeny, who eventually finally finished second and third, both set huge personal best times, and nine runners broke 2:10:00. The top four women set personal bests, but Namibian Beata Naigambo overcame the challenge of the previous year's winner Lydia Kurgat to clinch the title. Men's winner Vasyl Matvichuk, who is based in Northern Italy for most of the year, took his first Marathon title writes Diego Sampoalo. As runners passed through the four towns of Maranello, Formigine, Modena and Soliera, the temperature rose to above 20°C at the finish in the historic Central Square Piazza Martiri in Carpi. Anne Cheptanui Bererwe took an unchallenged win in the women's race in her debut at the distance. Six men were running at a 2:10 pace until 15km and although the pace slowed Lee Troop was then dropped as the lead pack went through halfway in 1:05:27. As the pacemakers dropped out at halfway and then 30km Matvichuk was left alone in the lead, 13 seconds ahead of Willy Korir. Matvichuk carved out a gap of 34 seconds and continued to increase his lead to 1:13 at 35km, but then began to suffer cramps. He nonetheless increased his lead to 2:57 at 40km. A leading pack of Bererwe, Russians Natalia Sergeva and Valentina Galimova and Marcella Mancini went through 10km in 35:52, halfway in 1:16:07 and 25km in 1:30:48, Cheptanui began pushing the pace at 26km. 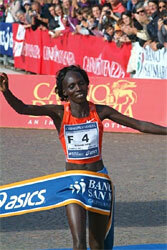 She led Mancini by 46 seconds at 30km and thereafter continued to pull away. "I am happy because it was my first marathon race," she said. "I plan to run another marathon next spring." Over 4000 runners finished, with over a thousand of them coming from outside Italy to enjoy sunny and warm conditions (14°C at the race start). Serbia's second largest city, the capital of Autonomous Province of Vojvodina, hosted the 17th edition this year with the start and finish right in the centre of town in front of City Hall. The course runs mostly along the Danube, beside newly constructed bridges and city districts, past the University campus and the old palace of the Assembly and Government of Vojvodina, and along the left bank of the river, across from the famous Petrovaradin Fortress. The weather was sunny (12°C) for the 200 participants in the Marathon, coming from 13 countries, which also included a relay race. Additionally, there were 1000 pupils from primary and secondary schools, and more than 150 children of pre-school age who took part in the Joy Race, together with their teachers and parents. World Champion Bai Xue of China defended her Beijing title in a time eight minutes slower than last year while Kenyan Samuel Mugo won the men's race with a personal best writes Jean Yung. Conditons at race start were good (8°C), but it turned windy in the second half. Pacemaker Nicholas Manza set a fierce pace, towing a group of six Kenyans through 10km in 30:00. By halfway this had split into two groups with Manza leading Mugo, Benson Barus and Rachid Kisri of Morocco. They reached 30km still on 3mins/km pace but Kisri started to fase soon afterwards. At 32km Barus and Mugo took over the lead, although Manza kept up. Mugo continued to press on and sprinted more than 10m ahead of Manza as the two ran past the iconic Bird's Nest stadium on Olympic Boulevard. 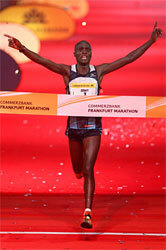 Mugo glanced back several times but claimed victory with a personal best of 2:08:20. In the absence of current world leaders, Chinese women swept the podium for the second year. Bai Xue, 20, the youngest ever World marathon champion, took the win followed by newcomers Zhang Xin and Zhu Xiaoling. At halfway Zhu was in the lead, chased by Ethiopia's Hayato Hasso and Bai. 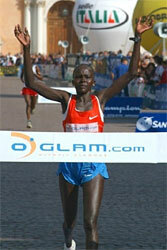 By 30km Alice Timbilili was only non-Chinese remaining in the five-strong leading group. She hung in tenaciously until, approaching 40km, Bai made her move and sprinted ahead for an unassailable lead. In his Marathon debut Gilbert Yegon won the 34th edition and broke Haile Gebrselassie's 2005 course record by two seconds writes Wim Van Hemert. The 21-year-old Kenyan was an impressive winner ahead of compatriots Elijah Keitany and Paul Biwott, who also both set personal best times. In nearly ideal weather (11°C, light wind and sunny) a large group of 26 set out on a fast pace (5km in 14:48). The pace stayed sharp and 12 men passed the half way mark in 1:02:57. That group stayed together until 30km (1:29:38) but the pace told in the next 5km with only four runners together at 35km (1:44:22) Yegon, Keitany, Biwott and Nicolas Chelimo. Yegon broke away soon after and was never in danger. He covered 35-40km in 14:48. "In the last stretch to the Olympic Stadium I was hindered by cramps in my legs." he said. "Had I not had this problem I could have gone under 2:06:00." Eyerusalem Kuma won the women's race ahead of compatriot Woinshet Girma. Hilda Kibet, Dutch by marriage, took the national title in third place. Kuma and Kibet led from the start with another another Ethiopian, Etalemahu Kidane. Only after 35km did Kuma break away, as Girma finished strongly to take the runner-up spot. Kasime Roba defended his title in the 31st edition, with fellow Ethiopian and debutante Bizunesh Urgesa taking the women's race. A big men's group thinned out slowly, with no significant move from Roba as Daniel Gatheru did most of the leading. It was only after 35km, as Gatheru faded, that Roba started to take control, gradually outpacing his closest rivals to win in a time a minute slower than he recorded the previous year. Ashu Kasim was the longtime leader of the women's race, passing halfway in 1:13:55 and staying ahead until 38km. She then faded, allowing the 20-year old Urgesea to come through for her debut victory. 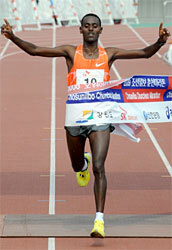 Gilbert Kirwa of Kenya broke both the defending champion and the course record writes Pat Butcher. When defending champion Robert Kiprono Cheruiyot took the lead shortly after 25km, it looked as if he was on his way to victory, but Kirwa pegged him back within 5km. They ran together until 38km when Kirwa gradually moved ahead to win by over 50m with Cheruiyot improving his winning time of last year by almost a minute. Cheruiyot blamed an ongoing hamstring problem, for causing him to slow down, and let Kirwa take the advantage. He said, "It's the same problem I had in Boston," where he finished fifth in April. Although he was on paper the fastest man in the field, with his 2:06:50 from ten years ago, William Kiplagat, 37, claimed beforehand that he is more of coach nowadays, principally to Cheruiyot. Yet he showed many of his young compatriots how to do it, by finishing third, also inside the previous record. Guenther Weidlinger, tenth, broke the 23-year old national record of Gerhard Hartmann by almost two minutes. After overnight rain and a misty early morning, the temperature for the 10:00 start was perfect at 12°C, with the sun breaking through. A group of 20 went through halfway in 63:35, half a minute slower than anticipated, but it gave the leaders the oportunity to run a faster second half, infinitely preferable to hanging on for grim death at the end. 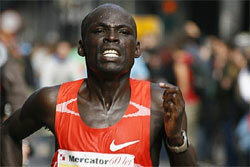 Kirwa recorded the 17th equal fastest marathon time on record and earnings of well over $100,000. John Komen broke the course record with 2:08:13, thanks to a faster second half on a very difficult section of the course writes Diego Sampaolo. Anne Kosgei won the women's race in a new personal best time. Two Kenyan pacemakers led an eleven-man group through halfway in 1:04:32. By 30km there were only six left. At the start of the famous Ponte della Libertà (Bridge of Freedom) at 34km which links Mestre with Venice, Komen and Paul Samoei broke away from Benson Cherono and Alexander Kuzin. After 35km Komen injected a fierce change of pace which proved to be decisive. 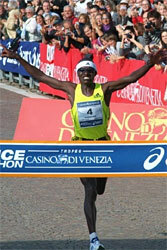 He still looked fresh in the final 3km when he entered Venice to face the famous 14 bridges which have made the Venice Marathon famous all over the world. Komen's winning time of 2:08:13 is very good considering that the leading pack was keeping a 2:09-2:10 pace until Komen changed gear in the final 12km. Paul Samoei in second lowered his lifetime best by 1:28. The women's race started a few minutes before the men's from Strà on the banks of the Brenta River. After a conservative start Bruna Genovese paced the leading group The leaders went through halfway in 1:13:46 but at 25km pacing finished and Kosgei took the initiative. Only the two Ethiopians Yal Koren and Haji Makda managed to keep up with her to start with, and at 30km (1:44:39) the race developed into a contest between Kosgei and Koren, with a neck and neck battle on the Bridge of Freedom as they went through 35km in 2:01:58. 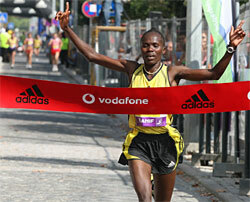 Kosgei was the stronger and carved out a winning margin of 40 seconds, improving her previous best from her second-placed finish in Venice 2007. It was her first career win, after three second places here. It was Koren's first ever marathon and four women dipped under the 2:30 barrier. Married Marathoners Andrew Smith and Tara Quinn-Smith from Toronto took the top places on their respective races. Andrew broke away from the pack in the first kilometres of the race. Trailing behind him were Janusz Sarnicki (Poland), Niklas Kroehn (Austria), and Brian Grudowski (USA). 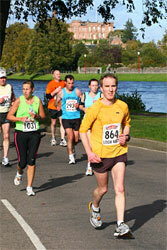 Andrew finished seven minutes ahead of his nearest rival. Tara Quinn-Smith followed up at 2:46:20, seven minutes ahead of female runner-up Emily Tallen. Husband and wife hope to compete in the 2012 Summer Olympics in London. The event attracted over 5000 participants. They came out to run in the Marathon, Half-Marathon, 10km and 5km. 1000 students also came to run in the Schools Marathon Challenge bring the number of participants to over 6000. The day offered perfect running conditions. 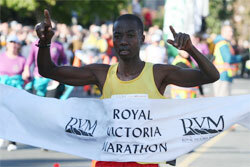 Next year's Niagara Falls International Marathon will be held on 24 October 2010. Just two weeks after her fourth place in the World Half Marathon Championships in Birmingham Caroline Cheptanui Kilel smashed her marathon best by five minutes in winning the 14th Ljubljana Marathon writes Bob Ramsak. She had set a best half marathon time of 1:08:16 in Birmingham. In between times "I just mostly relaxed" said Kilel, whose modest pre-race ambition was to break 2:30. She was in the lead group of four which passed halfway in 1:12:45, led by her husband, Vincent Kipkemboi, who continued to pace to 30km. 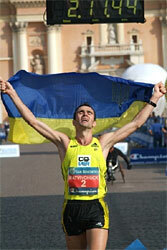 By 35km she had dropped the 2007 champion Tetyana Filonyuk of Ukraine and gave it her all over the final stages. Filonyuk held on for second and improved her personal best by almsoit a minute. The previous course record was Slovenian record holder Helena Javornik's 2:32:33 from 1998. In the men's race solid pace-setting kept the tempo on sub-2:10 target through to 35km with five men remaining in contention. William Biama was clearly the strongest, dropping William Kwambai Kipchumba by 40km. But Iaroslav Musinschi of Moldova came through strongly in the final stages, running almost stride-for-stride with Biama with 400m to go. Biama had enough left to dispose of the challenge and won in a time just 19 seconds shy of his career best. Musinschi, three seconds behind, improved his best by a minute-and-a-half. The first six finishers all dipped under the 2:12:49 event record set by Ukrainian Oleksandr Sitkovskiyy in 2007. The race, run in ideal conditions on a new more picturesque course, was also the farewell marathon for Slovenian record holder (2:11:50, 2000) Roman Kejžar. The 42-year-old, a three-time Olympian, was 12th overall in 2:19:24. Including Saturday's children's races and Sunday's marathon, half-marathon and 9.2km fun run, just under 20,000 people participated, approximately eight percent of the Slovenian capital's population. Kenyans and Ethiopians dominated at the front of the 15,000 strong field for the second edition of the race, writes Mohammed Benchrif. Kenyan Hillary Kipchumba, fourth the last year, won the men's race ahead of his compatriots Sammy Rotich and Amos Matei Tirop. The first Moroccan to cross the line was Abdelkarim Boubker in 12th in 2:21:59. 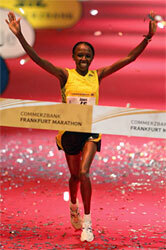 Ethiopian Amane Chawo was a clear in front of compatriots Yeshi Esayais, who was third in 2008, and Tgist Abdi. Morroco's Samira Raif ended up fourth in 2:41:00, the same finishing position as last year when she clocked 2:38:19. The race was held under difficult conditions, with temperatures reaching 28°C and 70% humidity. Consequently the record ambitions of the organisers for second edition of this the pleasant urban course were thwarted. 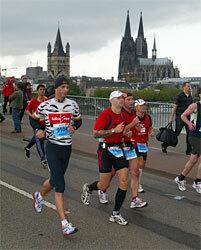 The 63rd edition attracted some 20,000 runners representing 20 countries. The lakeside loop course has great scenic beauty with autumnal colours on one side and crystal waters on the other. 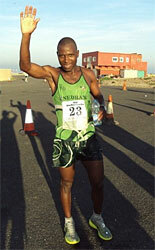 Both races were dominated by East African runners who occupied all the top placings. Mulugeta Wami, younger brother of Ethiopian legend Gete Wami, ran a personal best to win the men's race, beating a bevy of Kenyan runners. Running shoulder to shoulder, Wami broke away from second-placed Nelson Rotich at the kilometre-long hill starting 41km and ran through to the finish. The first Korean to cross the line was Shin Chul-woo in 12th with 2:18:18. In the women's race Korean Kim Seon-jeong was a clear winner ahead of her compatriot Noh Hyun-jin, who debuted at the distance. Gibraltar, a nation of close to 30,000 people, is one of IAU's newest members writes Nadeem Khan. It was the venue chosen for the IAU 50km Trophy Final in which selected runners were invited to compete on the basis of their times in 50km races around the world. Slightly misty and with temperatures in the mid-20s, the race was run over a 2km start section and six 8km laps. Lucas Nonyana won the men's race after a fierce competition with Michael Wardian (USA). Only in the last 8km did Nonyana move ahead Briton Paul Molineux, who had run very conservative race then came past Wardian to take second. Kami Semick took the lead in the early stages of the women's race and never relinquished it, although she slowed to finish outside her 3:20 target. Monica Carlin had started fast but faded in the middle stages before rallying at the end to regain silver medal position.